Egypt's Foreign Minister Sameh Soukry said on Wednesday that an agreement has been reached with his Lithuanian counterpart Linas Antanas to establish an Egyptian-Lithuanian business council to give a push to economic relations between the two countries. Speaking at a joint press conference following his meeting with Antanas, Shoukry stressed that the exchange of visits between the Egyptian and Lithuanian officials reflects the two countries' keenness on boosting bilateral relations. 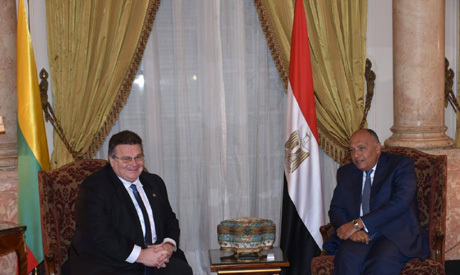 Shoukry added that his talks with the Lithuanian foreign minister tackled promoting relations between the two countries in the field of cyber-security and e-governance. Shoukry also said that he apprised Antanas on the economic reforms in Egypt and the efforts exerted by the government to improve the living conditions of Egyptians in education, health and infrastructure.